Now in its seventh year, Hamilton Wood Type and Printing Museum hosts its annual Wayzgoose Type Conference on Nov. 6-8. Participants may register online at http://woodtype.org. * Louise Fili – principal of Louise Fili Ltd., specializing in food packaging and restaurant identities. Formerly senior designer for Herb Lubalin, she was art director of Pantheon Books for 11 years, where she designed more than 2,000 book jackets. She is a member of the Art Directors Hall of Fame and is a recipient of the AIGA Medal for Lifetime Achievement. A best-selling monograph of her work, Elegantissima, was published in 2012. 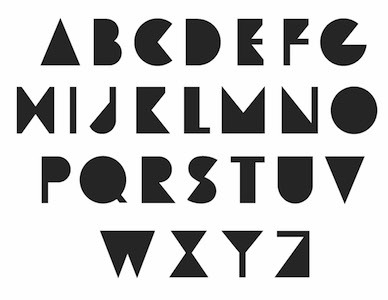 In addition to her Friday night lecture, Fili’s first typeface design will be unveiled during the Wayzgoose. Named “Mardell” for retired Hamilton type cutter, Mardell Doubek, this typeface will be available in both digital and wood type formats in early 2016. * Steven Heller – co-chair of the M.F.A. Design/Designer as Author + Entrepreneur program and the School of Visual Arts Masters Workshop in Rome. He writes a weekly column for The Atlantic online and The Daily Heller/Imprint online. He has written more than 170 books on graphic design, illustration and political art. * Marian Bantjes – typographer, designer, artist and writer. Her work is included in the permanent collection of the Cooper-Hewitt National Design Museum. Thames & Hudson published her book titled, I Wonder, and a monograph of her work titled, Pretty Pictures. She is a member of Alliance Graphique Internationale (AGI). * Daniel Rhatigan – Monotype’s type director of Type Libraries. He works on custom type development projects and consults on typographic issues. “Wayzgoose brings together designers, printers, typographers and letter geeks of all stripes from across the globe,” says museum director Jim Moran. “To keep a personal, hands-on approach, attendance is limited to 200 and filling quickly.” Capacity is full for the Nov. 6 workshops, but attendees may request that their names be added to a waiting list. Conference rates are $200 for students, $200 for members and $250 for non-members. Lodging is not included. Local hotel recommendations are available on Hamilton’s website. Wayzgoose 2015 will be held in Hamilton’s museum at 1816 10th St., Two Rivers, Wisconsin, across the road from Lake Michigan. The museum relocated to this 85,000-square-foot building in Nov. 2013. The move was made possible thanks to hundreds of volunteers and donors. “A handful of amazing companies have stepped up to support us as Wayzgoose sponsors this year. We couldn’t do this without them,” added Hamilton’s assistant director, Stephanie Carpenter. Ongoing support is needed to continue the museum’s educational outreach; collection acquisition, curation and exhibition; and facility upgrades. Please visit http://www.woodtype.org/support to make a donation. Follow Hamilton Wood Type and Printing Museum on Twitter at @hamiltonwoodtyp, on Facebook, on Flickr or on YouTube, or visit http://www.woodtype.org.